The ZoomTee System has two main functions. First, it helps your staff run your course more efficiently, with tools for managing the tee sheet, standby-list and memberships. Second, it allows your customers to book tee times and rentals over the Internet. 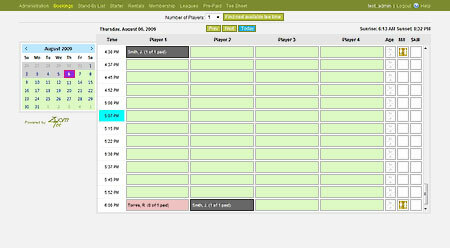 Improve tee time utilization through tee sheet, stand-by list and starter functions. Manage course and league memberships. Manage rentals. Track payments. Improve customer satisfaction by building foursomes of compatible players. 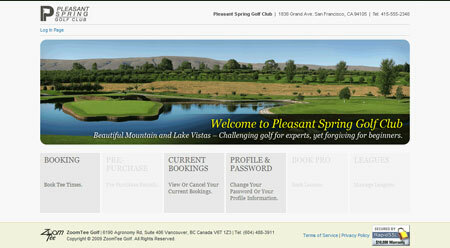 Increase your business by allowing tee time reservations and membership sales over the Internet. The system takes reservations 24 hours a day, increasing the opportunity for customers to book while reducing your staff's workload. Allow customers to self-select into compatible foursomes for happier players.